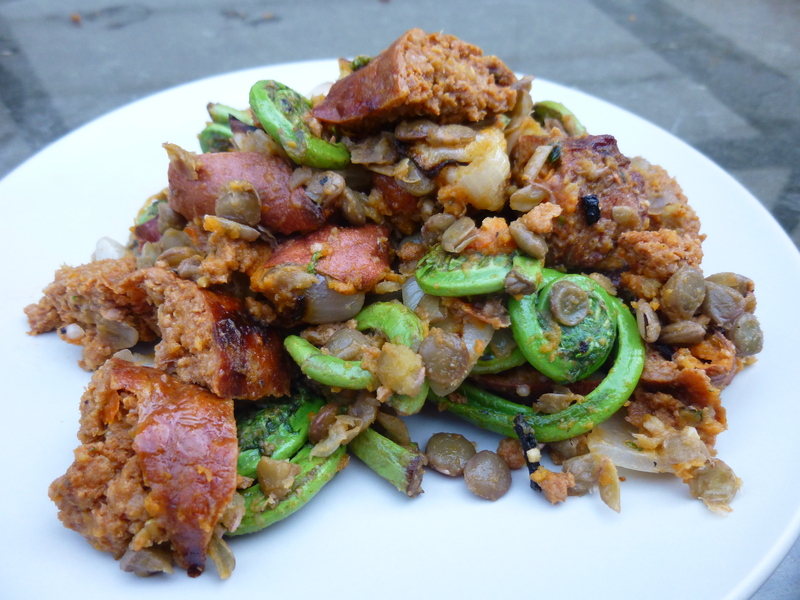 Grilling, chorizo, and fiddleheads! Doesn’t get too much better than that (unless you add lentils). Continually looking for more ways to incorporate non-meat proteins into the diets of meat-eaters, I’ve decided that chorizo (much like bacon) is a magic trick. Less meat, after all, does not mean no meat, and a flavored bit of spicy sausage provides an excellent source of protein as well as flavor. Chorizo in particular is a fabulous smoky spicy blend beloved by, well, most (hedging my bets here. There are always those odd ones who don’t like certain foods. So glad I’ve gotten over being a picky eater). So, why not mix the wonderfully enriching chorizo with our new favorite legume, the lentil? Why not, indeed. Add in a few grilled vegetables of your choice, and maybe a few sautéed ones too, a bit of dressing if you like, and you’ve got yourself a meal (I also recommend some grilled toast on the side). If you don’t have a grill, the additions to this salad can be prepared in the oven or on the stove as well, with only a slight difference in flavor (mostly it’s just fun to grill things). You can add anything to a salad—even random bits of old produce you might ordinarily throw away (reduce food waste!). Just as easy as a dinner kit, simpler, and evidently easier to source local ingredients. Fiddleheads are the thing at the moment (well, perhaps their moment is passing by now, it is quite fleeting. Apologies again for the delay). For those of you not from New England (the only place I’ve seen them, anyway), they’re these funny little fern fronds that perhaps taste like a mix between asparagus and a green bean. Most recipes I’ve seen for them recommend lots of butter to counteract their slight astringency (an endorsed suggestion, certainly not limited to fiddleheads). My new favorite dressing is a variation of Annie’s Woodstock dressing. It’s lovely on green salads, especially with avocado, and good for marinades, grain or legume salads, or as a dipping sauce too. Really what I’m trying to recreate is this fabulous dressing from my hometown, Planet Good Food Store dressing, which is similar to Annie’s except better (at least how I remember it). I haven’t quite got it down yet but I’m working on it—hopefully by the end of the summer. Tangy, flavorful, thick, creamy, but totally vegan (if that matters to you) and so so good. Besides, it’s a beautiful bright orange color. As usual, I recommend cooking a large pot of lentils at the beginning of the week, and then using them in recipes like this throughout the week. A delicious quick lentil meal (which may warrant its own short post at some point, but I was too hungry to take a picture so I want to tell you about it regardless) for a weeknight when you are rushing home is a lentil taco or tostado—sauté some greens, with onions if you like, or chop up some cabbage or wash some lettuce, and warm up lentils with a good dump of chipotle and a little cumin. Add a little sour cream if you want (although this is not really necessary), and place on top of a tortilla, chips, or toast. Add slices of ripe avocado and a little salsa, if you like (cheese too if you’re feeling it), and you are ready to scarf it down. A note on construction: You can add whatever you like to this salad, but here are my suggestions: I like having a little sweetness (sweet potatoes) to balance the smoky chorizo, definitely like having greenery to change the texture, add color and freshness, and onions make everything meld together. That being said, other combos or additions would be lovely too. More suggestions on salad combinations (in a composed salad) from the NYTimes. Cook lentils if you have not done so already. Heat up the grill. Bring the chorizo to room temperature. Chop up veggies for the grill (or however else you are preparing them)—I like slicing fat wide onion rings, and had small sweet potatoes so I just cut them in half. Toss veggies with a little oil and salt. Place on grill, with the chorizo, and cover top. While the veggies and chorizo are cooking, clean and trim the fiddleheads. Sauté in butter (or oil) until tender but still crisp. Make dressing: add all ingredients to a blender. Taste, adjust, and blend until emulsified. Assemble: When chorizo is cooked, onions brown, and sweet potatoes soft, remove from the grill and chop up into small chunks. Place everything in a large bowl (only add dressing as needed, you won’t use the whole batch for this—good thing, because you’ll want it for everything else this week) and toss. Serve (can also be served cold if you’d like to make it ahead, although better room temperature or slightly warm). Good for a crowd, and good leftovers too—make a large batch. I would say 5 or 6 days out of the week, my breakfast consists of yogurt, fruit, and oats. I haven’t gotten tired of it yet, due largely, I suspect, to the variety of possibilities within that prescription. By changing up your cooking techniques, or even that fact that it’s cooked at all, and the types of fruit, you can make a whole new dish! (Nudge: this is true for other dishes as well (surprise surprise)). Oats are super healthy, whole grains full of good fiber and antioxidants and all that. They’re also a fairly hardy crop, and are able to grow in places like… Maine! You can get them from Fiddlers Green, Maine Grains, Grandy Oats… sometimes even at your farmers’ market. I like them because of the texture and slight nutty flavor (which, again, depends on how you cook them). United with the sweetness of fruit and tangy creaminess of yogurt, it’s a perfect combo. I’ll tell you about making yogurt sometime soon—it’s very easy, although does always tend to take a little more time than I want it to (hands-off time, but still). Or, if you want to get a jump start, look here. By the way, if you’d like further advice on eating locally in Maine, here’s a piece on MOFGA’s site with some good resources. I seem to like sharing info about tech changes in ag, and some of it is a little dubious, although also exciting (I’m conflicted about judicious use of technology, can you tell? ), but here’s an article about some pretty great tech advances—mostly for helping reduce food waste. We do seem to place an emphasis on learning technology in schools, but we need to make sure to include ecology (through, say, school gardens) as well, to provide balance. Oh, and don’t forget about the importance of politics (a reminder from our articulate Mark Bittman). Now, back to breakfast. In order of ease (more or less. All are very easy): 1. Muesli 2. Oatmeal 3. Granola 4. Oat cakes 5. Smoothie. Mix together raw rolled oats, berries (I suggest strawberries if they are in season (admittedly those pictured are not), or thawed blueberries), and yogurt. Let sit while you make tea, get dressed, prep lunch, etc. (you can also mix it up the night before, if you like it really melded together). Eat! There are a bunch of method of making oatmeal. Pick your favorite. Mine is boiling water (which I do for tea anyway), and pouring it over a bowl with dried oats, prunes (also not local. Oh, well), cinnamon, and a little salt (it makes a difference, trust me). Cover with a plate to keep in the heat and let sit while you get dressed, prep lunch, etc. When you’re ready, uncover, cut up some of the prunes with your spoon, and stick it in the microwave for thirty-or-so seconds, just to heat it up again and get rid of any excess water. Stir, mix in some sweetener if you like (maple syrup! ), and eat. Yogurt can be enjoyed on the side or mixed in, after the oatmeal cools a bit (yogurt and heat aren’t real friends). Make granola the night before, a big batch on the weekend, or the morning of if you don’t have time for any of that. Preheat oven to 350ºF or so (flexible). Melt a little butter in a large, rimmed pan or baking sheet with a large bit of honey (maybe 1/3 cup to every 2 cups of oats, depending on your sweet tooth)—I usually just put it in the pan in the oven to melt, although then you’ll have to be careful mixing it all around. Vegetable oil instead of butter is okay too, and you can do it in a separate pan if you prefer. Add a bunch of rolled oats, some cinnamon and other spices if you like (allspice, ginger), salt, and mix around. Add nuts, unless you have already toasted nuts (almonds or pecans are my preferred additions) and dried fruit, if you like. Stir around until the butter, honey, and spices are reasonably well distributed (if you have slivered almonds or other smaller pieces of nuts, add them later or they will burn before the oats get toasty). Put in the oven for 15 or so minutes, stirring every once in a while to make sure all sides get toasty. The oats should become nice and golden. Remove and let cool. Can be stored in an airtight container for a while. 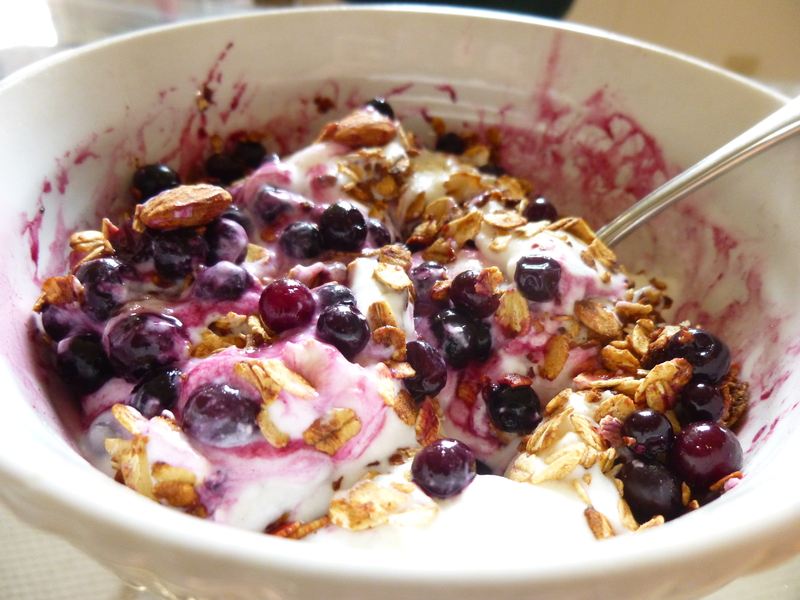 When ready for breakfast, mix granola, fruit, and yogurt. Eat. This was a bit of an experiment, and I was rather pleased! I often add oats to my pancakes, but haven’t really made purely oat-cakes until now. Mix an egg, a bunch of oats, and a little milk or water (and some salt). Let sit for a while while the oats absorb the liquid. You should be able to form it into patties; heat up a pan with butter, and do so. Cook at medium temperature until cooked through and golden on each side (flipping halfway). Top with fruit, yogurt, and maple syrup. More in the fruit-and-yogurt realm than also with oats, but turns out you can also add oats to your smoothie if you are thus inclined! In a blender (or a mixing cup with an immersion blender! ), mix berries (or other fruit, like frozen mangos or peaches, peeled), a banana, and a couple large scoops of yogurt. Add a little extra yogurt whey, some tea, or whatever other liquid you have lying around (juice works fine. I just don’t have it around ever, and it can add too much sweetness). Add oats too, if you like. Blend until smooth, taste, add more yogurt/berries/sweetener and blend again, and enjoy (sipping, or with a spoon. Or both). 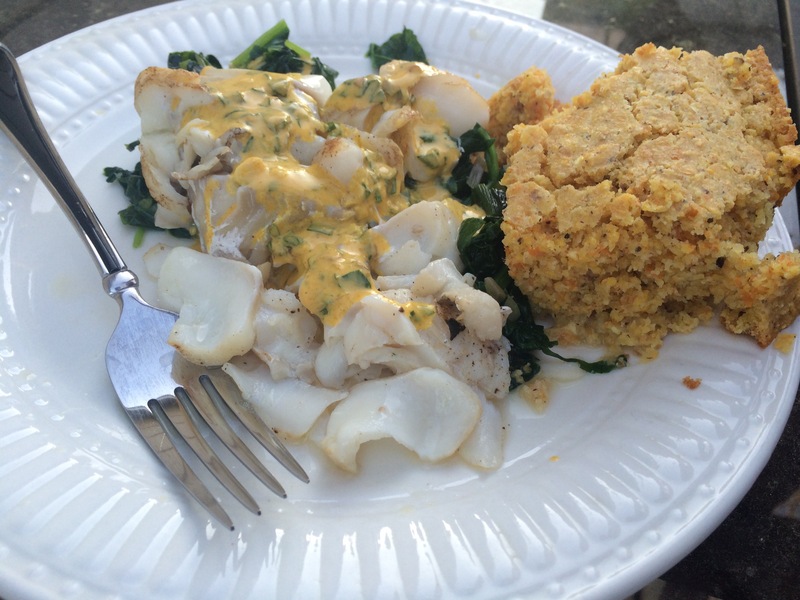 Two dishes, minimal effort and, more importantly, little active time. I’m just planning your week for you, aren’t I? You’ll even have enough food to bring soup to a potluck AND eat it for lunch for a couple days, and share some meat with your friend who comes over to help paint the house. Speaking of a new house, how neat would it be to grow your furniture in the shape you want? It’s my dream. Food can change someone’s life, as exemplified in DC kitchens. The key to both of these dishes is Time. Lots of time in the oven makes the meat tender and flaky and flavors the juice, and time on the stove caramelizes the onions so they have a depth of flavor it’s hard to believe comes from the sharp white vegetable. Cooking methods like this are helpful for a variety of cuts of meat. If you buy half a cow or pig (which is often cheaper, and better for the farmer: if you want to eat more ecologically sensibly, this is the way to do it, because it forces you to use all parts of an animal—much like a vegetable CSA), or hunt and get a whole animal, you will end up with large chunks of meat that take a little more work to tenderize. This process—what my dad aptly terms “low ‘n’ slow”—is perfect for those cuts. I actually used a top round steak here, which could be cooked in other ways, but this is what I wanted and goodness, it’s delicious. Also, it was water buffalo from the ME Water Buffalo Co., I think extra flavorful. It also makes for a great no-recipe recipe. French onion soup is a little more of a process, but still fairly straightforward. Turn on the oven to 200ºF or so. Chop up the onions and garlic (garlic you can also leave in whole cloves). Rub the meat with salt and pepper. In a Dutch oven, if you have one (or an oven-proof pan of some kind), heat up the oil and sweat the onions and other veggies (sauté until soft and fragrant). Move to the side of the pan and add the meat. Sear/brown the meat on both sides, just to get some color. Stir in the herbs. Add the wine and deglaze the pan—scrape up all the brown bits from searing the meat and any onion that may have caramelized. Add the rest of the liquid until the meat is covered (or at least mostly covered—I kind of topped it with veggies to keep it moist). Cover and put it in the oven and let cook for 4 hours or longer (I actually left and let it cook. Make sure your fire alarms are set though). After a long time, remove from the oven. The meat should fall apart and there will be a lot of juice/wine sauce. If you like, you can top pasta (or croutons, as below) with this ragu (although that might not be quite the right definition. A traditional ragu may be made on a stove?) and a little parmesan, and leave it at that. Alternatively, use the juice to make French onion soup, and then make the meat into sandwiches (now or later), eat it on polenta, or put it (san jus) on pasta later! That way, you can also make soup. Begin with the onions. Chop, against the grain, very thinly. Melt butter in a large pan over medium high heat and add the onions. Let sit until beginning to brown, then stir. Let brown for a few more minutes, then stir again. Keep stirring—they will brown more quickly as they heat up, so watch that they don’t burn and turn the heat down if necessary. You aren’t trying to burn them, but get a nice caramel color and let them sink into themselves. This takes, you guessed it, time. Add the garlic and salt near the end of the process. Once the onions are caramelized, add a little flour and mix it in, cooking just for a minute or so to get rid of the raw flour taste. Add extra butter if needed. 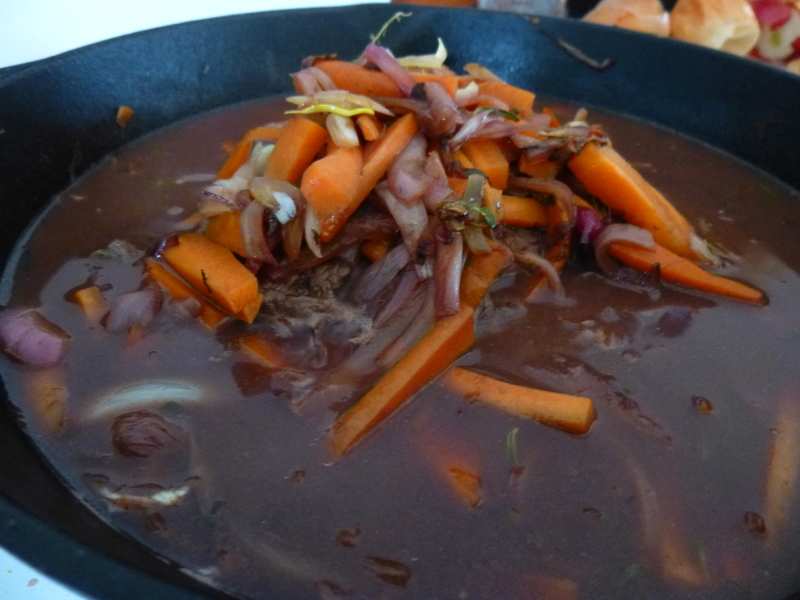 Then add the rest of the ingredients, scraping up the bits of onion stuck to the pan (if you can warm up the stock beforehand, this is better). Simmer for as long as you have—again, more time=more flavor, but since you’ve roasted the meat in wine juice, there’s already lots of flavor so you don’t need to let it go all day here. It should be a beautiful deep brown color. If you’d like to make cheesy croutons (highly recommended), chop up some bread (I like the hardier, seedy ones for this but your preference) into small cubes, put on a baking sheet, drizzle with olive oil, and toast in the oven for 15 minutes or so (temperature around 350ºF, or whatever if you’re cooking something else too). Once starting to get crispy, top with cheese of your choice, or a mix of cheeses (recommended). I did it this way so I could transport them both, but if you are serving it right away, put the soup in bowls, top with croutons and cheese, and place in the oven to melt the cheese, ending with the broiler to make it nice and crispy. Mmm, soup. Before you leave, dancing cows!! *The whey I used was acid whey (as opposed to sweet whey), from when I made ricotta. I hate wasting things, and I do think it added a certain solidity to the juice and a little extra oomph.